REDEEM GIFT CARD AT MURPHY BROADCASTING, 2068 MCCULLOCH BLVD N., LAKE HAVASU CITY 86403. PLEASE BRING RECEIPT. MURPHY BROADCASTING IS OPEN 8 AM – 4 PM AZ TIME (EXCLUDING HOLIDAYS). SORRY, NO EXCEPTIONS. GIFT CARDS CARRY NO EXPIRATION DATE. GIFT CARDS AMOUNT DOES NOT HAVE TO BE USED AT ONE TIME, LEFTOVER CREDIT CAN BE USED ON YOUR NEXT VISIT. GIFT CARD VALID AT THE LAKE HAVASU CITY, AZ ROSATI’S LOCATION ONLY. 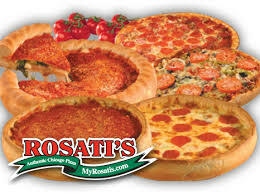 Rosati’s Authentic Chicago Pizza has been a Chicago Tradition since 1964. We make our food the old-fashioned way with homemade sauce, dough, and lasagna made fresh daily in each store. Visit Rosati’s for great food and family fun! Rosatis is located next to the London Bridge at 91 London Bridge Road, Lake Havasu City, AZ. Cash Vouchers good towards any food anytime, any day.